This screen lets you add a new user. Simply fill in the blanks. Enter a valid email address and name info. 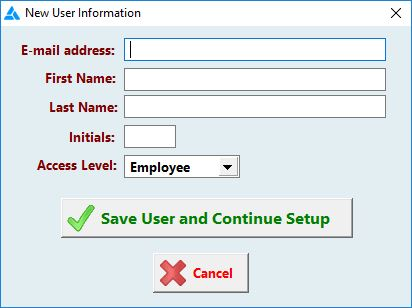 *Access Levels - There are two access levels available at this time : Employee and Administrator. Administrators have the ability to make changes to the password system. Employees do not. Frazer will send this new user a temporary password to the email address you provide. The new user will be prompted to change their password when they first login.